There’s nothing like hitting the red dirt and travelling for hours without seeing another car. Nothing compares to setting up your rig in the middle of nowhere, far away from the hustle and bustle of the city, to spend the night under the stars. For kids, there’s no better playground than what nature has provided to stimulate the imagination. Who needs fancy electronic gadgets when you are treated to sensational sunrises and sunsets – free of charge? 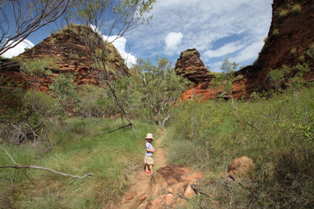 Our three kids have seen every corner of their spectacular homeland but nothing inspires more than the far-away, often hard-to-access spots that make up the outback. There’s nothing more exciting to a child than exploring new places or seeing animals that other kids only read about in books. This is the school of the road and one thing’s for sure, it’s anything but boring. Once you’ve experienced the outback you’ll keep on going back for more – at least we do. From the awe-inspiring beehive domes in the Bungle Bungles to the fascinating copper-coloured hills of the Painted Desert, from the majestic gorges in Carnarvon Gorge NP to the World Heritage-listed rainforests along the Bloomfield Track, the outback is full of surprises, waiting to be discovered. Australia’s interior has also been the centre stage for countless stories of pioneers who made a living in the most challenging and extreme conditions – this is history coming alive in a way that kids will remember. You will undoubtedly come across wildlife – some poisonous – so this is the time to educate your kids. Snakes are common and must be treated with respect but there’s no need to terrify your children. Our kids know these reptiles are dangerous and will move away when they spot one. We’ve taught the kids not to play in tall grass or near stacks of firewood and they automatically keep an eye out when bush walking. From our personal experience, kids as young as three years of age are able to go on walks while the younger ones can bump along on mum or dad’s back in a special hiking backpack. A Baby Bj?rn Miracle baby carrier has been designed to carry your little one for expended periods of time so you don’t have to miss out on seeing the most spectacular sites. Some of our favourite outback destinations include the Flinders Ranges, Arkaroola, the Bungle Bungles, the Gibb River Road and the Savannah Way. Places like Normanton, Karumba and Lawn Hill NP are not to be missed. There’s plenty more to see but you’ll just have to go and hit the red dirt yourself – you will not be disappointed.